In the years of peace that had followed the Napoleonic Wars many felt that the country had neglected its military and coastal defences. Despite an alliance with France to defend Turkey against Russia in 1854 reports of ‘menaces towards England of certain French officers’ caused national alarm and an almost irrational fear of invasion. In response the Government reintroduced the 1804 volunteer movement of local militia and made it a permanent reserve of the country’s military force. Moves were also made towards improving coastal defences and the particular vulnerability of low lying parts of the Sussex coast from Brighton to Bognor and beyond were especially noted. 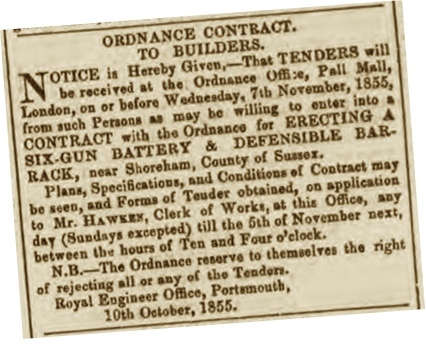 A report of March,1855 stated that an armament of five eight-inch guns was ‘in contemplation’ for Shoreham then on the 10th October that year plans for the number of guns were increased and the extent of the building indicated when the Royal Engineer Office at Portsmouth invited tenders for an ordnance contract to erect ‘a six-gun battery and defensible barrack near Shoreham for the lodgement of troops and defence of the port.’ The work was to be completed by the 1st November 1856 under penalty of £35 for each week’s delay and a forfeit bond of £1,000 for non-completion. Ultimately costing £11,685 it had emplacements for the six guns and ditch defences. The guns commanded a clear view over the harbour entrance approaches and the coastal beaches with the intention of preventing assault by invading ships and landing parties using the quays to supply and reinforce troops for attacks on Portsmouth and London. Due to delays in the release of money to fund the project the construction work was not completed until 1857 and in February the following year artillerymen were reported as still being ‘engaged mounting six 68 pound guns on slide and traversing carriages.’ Three guns covered the sea and three were to perform nearly a complete circle over both sea and land (although later reports show that the actual extent of the arc of fire was rather more limited). 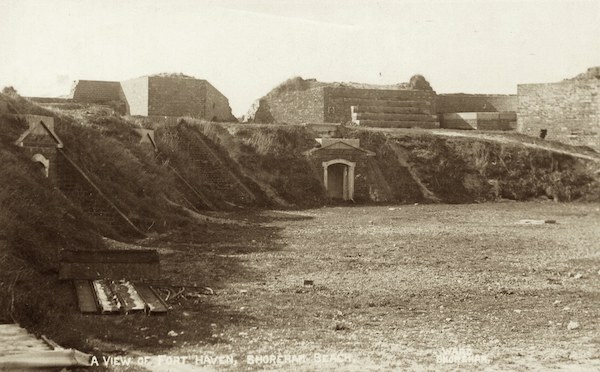 It had a ditch, walls with loopholes for musketry, subterranean passages, substantial block houses roofed with brick to withstand cannon fire, magazines and barracks for 70 men that to begin with was maintained by just ‘a few invalids of the late war.’ Shortly after the guns were ‘practiced to test the stability of the works.’ By November that year Lord Vivian and men of the Royal Artillery delivered shot, shell and ammunition – each gun received 130 rounds and for each shot 16 pounds of powder were required to propel missiles 3,000 to 4,000 yards. Following completion of the fort tenders were put out in 1858 for contracts to undertake ‘artificers works of all kinds’ (engineering) as may be needed to maintain the fort in good repair. The contract also included Shoreham’s coastguard station and all other buildings the Royal Engineer’s Office was responsible for up to and including Rottingdean. Work, preparations and the manning of the fort must have been satisfactorily completed by August the following year when Colonel B. Cuppage commanding the Royal Artillery in the Dover District and Colonel Bloomfield the Inspector General of Artillery inspected the artillery battery at Brighton and the fort at Shoreham during their tour of all the towers, batteries and forts between Shoreham and Dover. Despite being newly constructed most of the defensive line of forts built along the coast including Shoreham were heavily criticised as being ineffective. Proposals were put forward to install a new battery at the harbour entrance near the lighthouse and two others on the east and west beaches. There would have been as many as 30 guns in total and the west beach defence was to accommodate 200 men. Fears of invasion though were rapidly receding and these recommendations were never implemented but in1873 another review detailed numerous critical deficiencies. Even at the time that it was built the fort’s construction was out-dated and by then was even less likely to withstand bombardment from the modern explosive shells fired by the latest steamships. By the same token the fort’s smooth bore guns were obsolete and completely ineffective against the metal walls of those ships. The magazines were inadequately protected being susceptible to falling shells; the guns’ angle of fire was limited leaving the fort susceptible to attack from the land and perimeter defences were inadequate. Once again though no action was taken and perhaps on the basis that an obsolete defence is better than no defence at all the fort continued to be manned albeit by a reduced garrison. It seemed that the writing was on the wall when in April of 1891 men from the Brighton Artillery were sent to Shoreham Redoubt to remove four of the heavy guns. But no, shortly after the ordnance was updated the remaining old smooth bore guns were replaced by three 64 pounders RML (Rifled Muzzle Loaders) and two 80 pounders RML each weighing five tonnes. False hopes though as these were only old smooth bore guns converted to save cost. The 64 pounders remained in service until 1908 and the 80 pounders remained until 1921 (except that another report indicates there was just one gun left in 1915 – see ‘parting shot’ at the end of this article).. 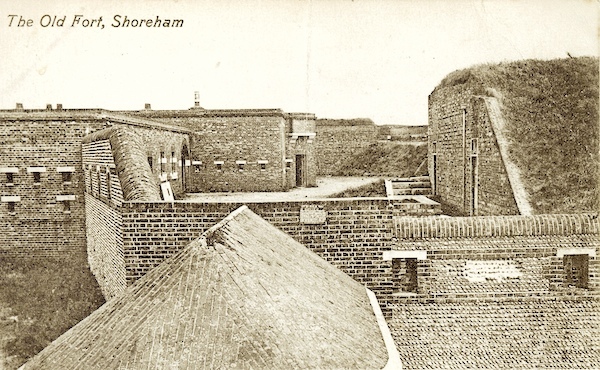 There was some limited use of the fort during WW2 but as with other important architectural relics of Shoreham’s past a huge chunk of the fort was destroyed when the barracks were demolished in the 1950’s. Luckily there has been work carried out in subsequent years to save what remains and hopefully its future is now more assured including perhaps the rebuilding of the barracks following the formation and efforts of the ‘Friends of Shoreham Fort’ preservation society and the classification of the fort as an ancient monument. The Regulars – These were professional soldiers serving with the Royal Artillery who came from all over the country. Their postings (to Shoreham at least) seemed to be short, not lasting on average more than two or three years and they were often accompanied by their families. The initial indications are that the garrison was intended to be manned by about 50 soldiers but it seems that just seventeen men, women and children were recorded as actually living there in 1859 –were these the‘invalids of the late war’ mentioned earlier? Neither do the census snapshots for subsequent years show any more than ten soldiers and their families in residence at any one time. Perhaps as fears of invasion subsided a more complete manning of coastal defences was not considered necessary or maybe other troops billeted nearby could be called upon at short notice? Military and regimental records could reveal more on this but historians generally seem to be of the opinion that the fort was never much used. Shoreham Artillery Volunteers – By about the 1880’s the regulars were replaced by local part-time volunteers and living in at the fort seems to have ceased. Shoreham’s volunteers were established when Colonel Chermside succeeded in establishing additional batteries of Volunteer Artillery at Lewes, Worthy (Worthing?) and Shoreham (Dover Express 5th December 1873). These were part of the 1st Sussex Artillery Volunteers based in Brighton and the Shoreham Company were to have their orderly rooms in the High Street next to the town hall and their drill hall on Ropetackle. 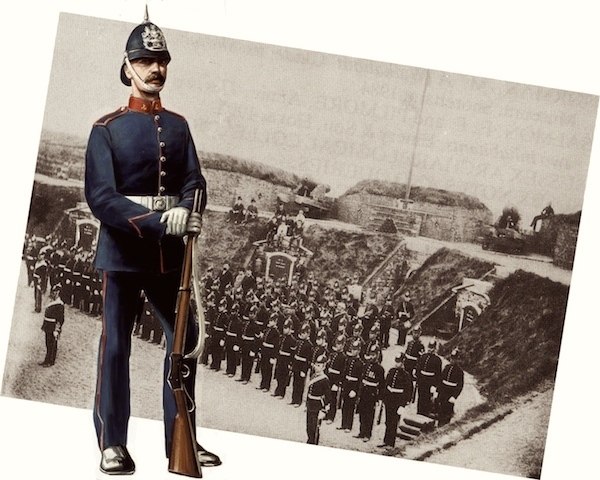 A couple of years before before the Shoreham Company was created Shoreham harbour and the fort featured in exercises on Easter Monday 1871 when particularly large scale military manouvres involving volunteer regiments were carried out. The early stages involved a force landing between Brighton and Shoreham, sections of which were to attack the batteries defending Shoreham Harbour and another to hold the railway. The detachment having reduced the batteries and admitted a fleet of transports with cavalry and artillery on board into the harbour Shoreham moved to Brighton to rejoin the main invading force. The ‘battle’ continued with the invaders advancing to Lewes where the defenders there were reinforced by troops from the Lewes & Tunbridge Wells Railway that retook the offensive and attacked the invaders (Leeds Mercury 23rd March 1872). Following their formation Shoreham Volunteers were soon similarly involved on later exercises and the numerous newspaper reports of the time provide a distinct impression that all types of Volunteer regiments throughout the country were regularly trained and tested. One of the ways that Artillery Volunteers were encouraged to drill and practice on all aspects of artillery was through the annual competition run by the National Artillery Association at Shoeburyness. This involved timed exercises to put together a dismantled gun culminating in a series of shots at a target. 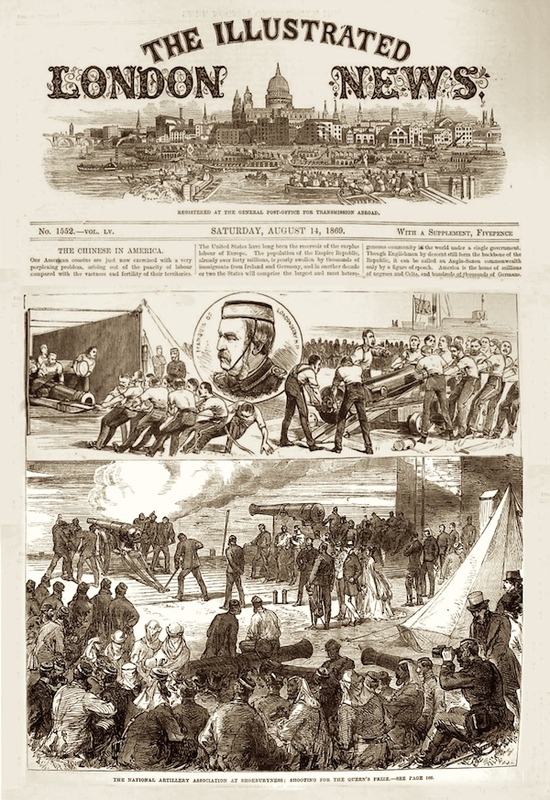 In 1865 a detachment of the 1st Sussex Artillery Volunteers selected entirely of employees from Messrs Hanningtons stores in Brighton won both the prestigious Queen’s Prize and the Lord Palmerston prize at Shoeburyness (Bell’s Weekly Messenger 12th August 1865). Shoreham though was also to achieve success when Sergeant Major William.T. Streader’s detachment from the Shoreham Battery took the Prince of Wales prize at Shoeburyness in 1879 ‘the prize consisting of ten silver cups all taken by Major Streader’s detachment’ (The Standard 11th & 12th August 1879). During the final day’s inspection it transpired that there was more to William Streader than his prowess as a sergeant gunner and the circumstances of this discovery warrant inclusion here. Shoreham was also involved with other units in competitions and on Saturday 30th June 1883 Shoreham staged a ‘great gun’ competition for all the Sussex Batteries but without apparently winning any of the prizes. An inspection of the Sussex A.V. Batteries in April 1890 though resulted in Shoreham under Captain Gates coming first with 228.75 out of a possible 280 although the points awarded were perhaps as much to do with condition and efficiency of the battery as much as (if at all) the accuracy of their shooting. 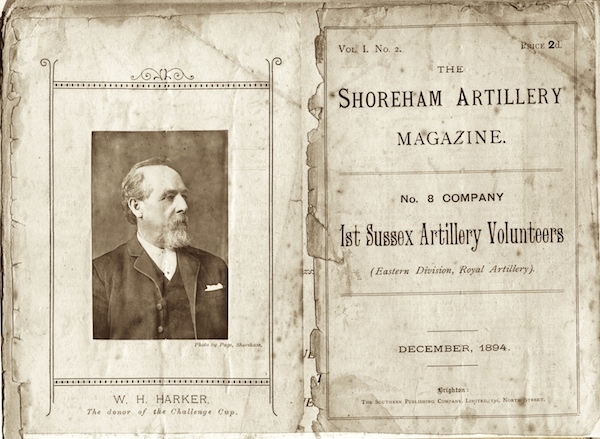 In September of that year William Harker J.P., and well known proprietor of Harker’s Stores in the High Street donated a cup to the Shoreham Battery that was shot for by 36 men using carbines, a type of short barrelled rifle. Five shots were allowed at 200 and 400 yards and the winner was Corporal Linscer with a score of 40. The fort’s guns were not always used solely by the men of Shoreham Battery. In June of 1890 for example a squad from the Lewes Battery travelled to Shoreham Redoubt to practice with the guns there. Similarly, Shoreham men used other companies’ guns as in 1903 when company orders gave instructions to attend gun practice in Newhaven Fort and that no gun practice would take place at Shoreham Redoubt that year. 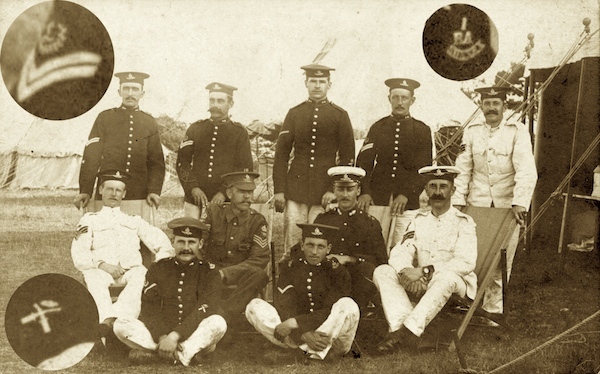 The Battery in 1891 consisted not only of Shoreham men but also from Worthing, Southwick and Portslade and about 80 of them were then currently ‘efficients’ or proficient in their field of responsibility. It was during this year that the battery had also undertaken ‘the onerous and responsible duties of the fire brigade’ but the commanding officer complained that they had not then yet been issued with a uniform (Sussex Express 23rd January 1891). 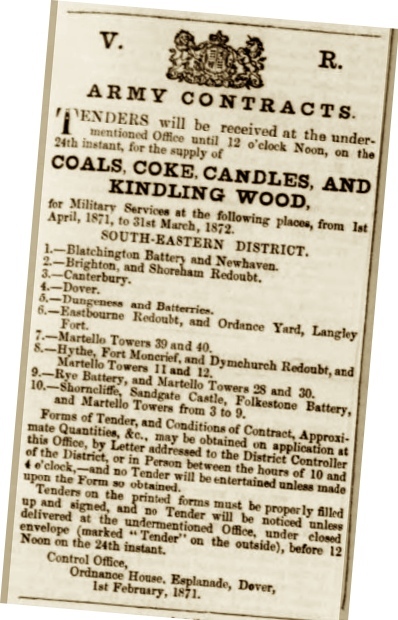 There may no longer have been any permanent living accommodation at the fort but in February of that same year the Army was still seeking tenders for the supply of coal, coke and kindling wood for Shoreham Redoubt (Sussex Agricultural Express 13th February 1891). Noted as being men from the 1st Sussex Royal Artillery Volunteers the badges at the top of the sleeves of the two men sitting cross-legged show ‘1 RA Sussex.’ The stylised ‘L’ surrounded by a wreath indicates the wearer was a ‘gunlayer’ who set the gun’s angle of fire and therefore the range typically using a hand wheel. – another man, the ‘trainer’ separately controlled the lateral rotation. 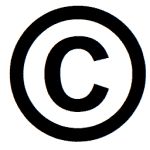 The crossed cannons surmounted by a crown denotes a battery first prize badge i.e. the wearer is a member of the top battery in the annual shoot. The remaining men though have no county badges and there is a mixture of uniforms which probably only serves to emphasise that the uniforms available for Volunteers often had to be ‘take what comes.’ The flat caps without peaks were known as ‘Brodrick’ hats and were in general use only for a short time between 1902 and 1905. Artillery Volunteers on parade at the fort in the around the turn of the century. This would have been the total complement of Shoreham Company and their activities by then were becoming more centered in town at the drill hall with exercises also carried out on the Downs. Robert Taylor. Master Gunner R A. 1831 Woolwich, Kent. George Austin. Corporal Royal Artillery. 1837 Shepherdswells, Kent. Robert Day. Bombardier R A. 1838 Scotland. Samuel Adams. Gunner R A. 1841 Liss, Norfolk. George Hillier. Gunner R A. 1833 Steeple Ashton, Wilts. Richard Moulding. Gunner R A. 1835 Penrith, Cumberland. John Seymour. Gunner R A. 1833 Shafford. Cornelius Shea. Gunner R A. 1830 Surrey. John Bicknell. Gunner. R A. 1833 Willand, Surrey. James Kerr. Corporal Royal Artillery. 1837 Ireland. George Davis. Bombardier R A. 1843 Windsor, Bucks. James Beines. Gunner R A. 1840 Killyman, Ireland. John Moore. Gunner R A. 1837 Tunbridge, Kent. 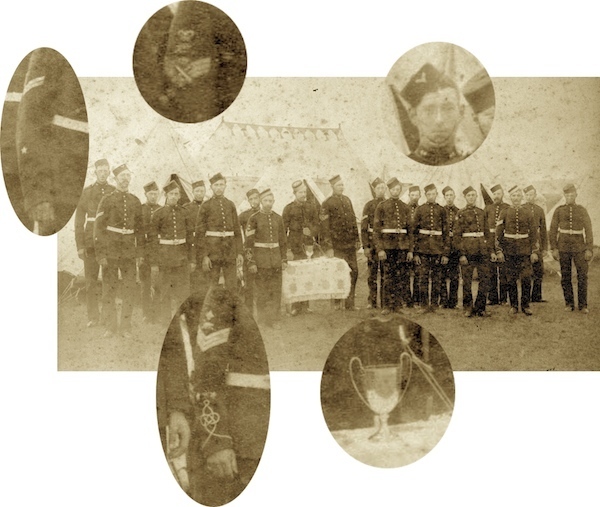 Corporal Linscer; Corporal Simmons; Gunner Newbery; Gunner Gates; Gunner J. Denyer; Corporal Scrase; Gunner R.Streader; Gunner StringerBombardier Earthey; Gunner G. Pullen; Gunner Markwick; Corporal Payne; Gunner C. Denyer; Bombardier Hayward; Gunner Voice; Trumpeter Fraser; Corporal Boxall, Gunner Gadd, Bombardier Burstow, Gunner Higham, Gunner Pocock, Gunner C. Linscer, Gunner Stevenson, Gunner Blunden, Gunner Lelliott, Gunner Sawyer, Gunner Newman, Gunner Streeter, Gunner Dunstall. 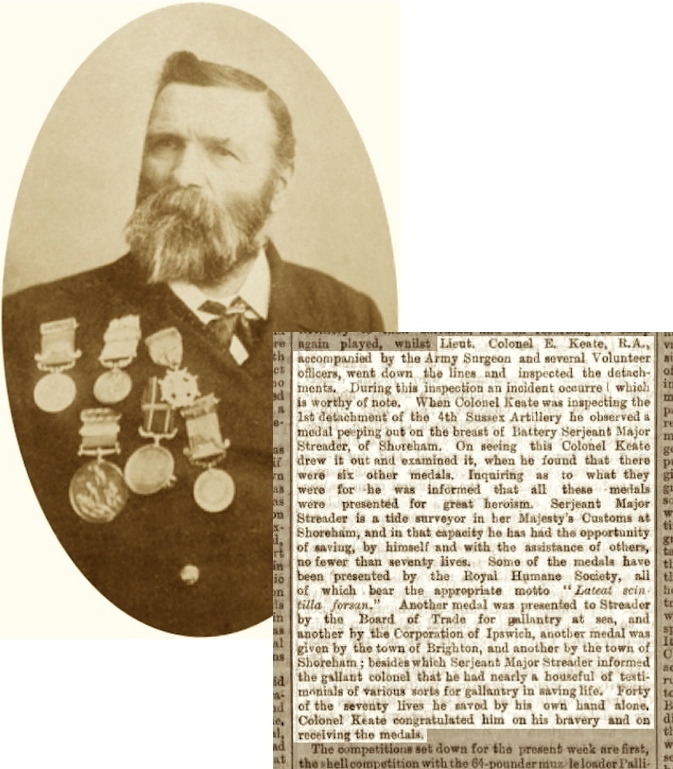 *Major Gates, as he was subsequently promoted to, resigned his command of the local battery in 1890 having joined in 1875 and commanded since 1882. Captain Sugden Gates took over command shortly after. Caotain Gates; Lieutenant Dell; Sergeant Woolver,; S.M.Harvey; Gunner Streader; Corporal Linscer; Gunner Lea; Gunner Adams; Gunner Markwick; Gunner Turner; Bombardier Earthey; Corporal Payne. (shooting match between the Lewes and Shoreham Companies Sussex Express 13th May 1892). W. P. Rigden, Captain, commanding No. 8 Company. (Sussex Agricultural Express 1st August 1903). 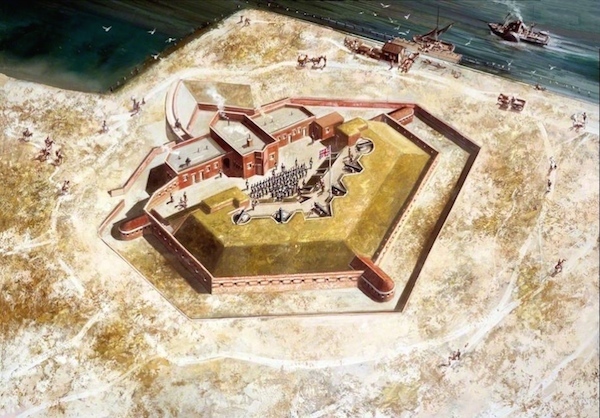 West Sussex County Council and the artist Mike Codd for permission to reproduce the painting of the fort in 1858 and the soldier of the Sussex Artillery Volunteers.